Red grapes are made into red wine, grape juice, jams and jellies, or simply enjoyed fresh off the vine. They make a low-calorie, nutritious snack. Red grapes and many other dark-skinned varieties contain numerous compounds that provide many health benefits. Red grapes tend to be fairly sweet, although color and ripeness are important factors. All table, wine and raisin grapes come from the same family and genus of vine, although there are more than 60 different species and literally thousands of grape varieties, according to "Superfoods: The Healthiest Foods on the Planet." Table, wine and raisin grapes come in all colors, including red. Red table grapes are often larger in size, seedless and have relatively thin skin. In contrast, red grapes used for wine production are usually smaller, contain seeds and have thicker skin. Red, green and purple grapes are the most commonly consumed colors in the United States, although yellow, black, blue and pink varieties exist also. Red grapes contain a variety of phytonutrients that have been well studied and declared beneficial for health. Perhaps the best known is resveratrol, which is a powerful antioxidant found mainly in the skin of dark-colored grapes, but also in the seeds and flesh in lesser amounts. The antioxidant ability of resveratrol and other flavonoids in red grapes has proven to effectively eliminate free radicals and reduce tissue damage and aging, which stimulates immunity and reduces the risk of cardiovascular diseases and some types of cancer such as breast, prostate and colon, according to the "Natural Standard Herb & Supplement Reference." As a general rule, the darker the skin color of the grape, the more resveratrol it contains. Furthermore, red grapes and other colors contain melatonin, which is a hormone that regulates your sleep cycle and influences many other hormones. To get the most flavorful red grapes with the highest concentrations of antioxidants and nutrients, always pick those that are fully ripe, which look plump and free of wrinkles. They should be firmly attached to a healthy stem and not leaking any juice. The primary way to predict sweetness of grapes is via color. Red grapes should be deep red in color for most sweetness, although sweetness also varies according to species. 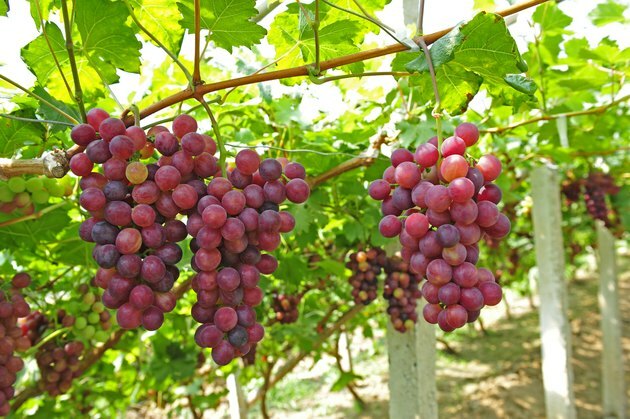 Red grape varieties known for sweetness include emperor, cardinal, monukka and globe. If you buy some red grapes from the grocer and find they are not sweet enough for your palate, let them ripen a day or two more on the vine. Unlike some other fruits, grapes will not ripen any further once removed from the vine. All varieties and colors of conventionally grown grapes consistently have higher levels of pesticide residues compared to other fruits and most vegetables. Consequently, it's important to thoroughly wash all grapes bought from the grocer, even if they have an organic label. There are some natural plant-based additives that can be added to water for grapes and other produce to soak in. These additives help break down the pesticide compounds attached to the produce.